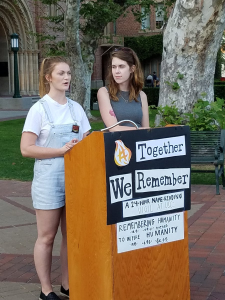 Hosting an event is always a great activity to do at your campus – not only is it an incredibly effective way to advocate, fundraise, or raise awareness, but it’s also a great way to generate members! This guide contains tips and suggestions for planning your event. Use it as a reference to create a successful, informative, and engaging occasion! What has been going on in the conflict areas recently, and could my chapter address these developments in an event? Have there been any notable policy asks in Washington, D.C. recently? An Opportunity for Collaboration: Is there another student group on campus holding an event that your chapter could partner with? These student groups could be other human rights groups or clubs that are completely different from STAND such as club soccer or an a Capella group! 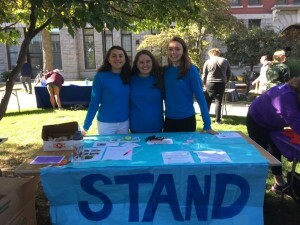 When National STAND Promotes a Campaign: your Field Organizer would be happy to help you bring one of STAND’s national campaigns to your school! The necessary steps to plan an event varies from school to school. Always be sure to get the necessary permission weeks in advance for the event itself as well as the location. If you are doing a movie screening, be sure to obtain the rights to the film. Do you need help from a teacher or professor? Ask early! Contact your department to see if there are preliminary requirements that your student group needs to fulfill before holding your event. Organize your members— split tasks accordingly and assign a point person to each task so that everyone has a hand planning the event! Choose a date and time— choose a time that both your club members and students on your campus will be available (i.e. not a holiday or weekend). How big of a space will you need? Will the weather permit an outside event?? Get the necessary approval well in advance so that your group doesn’t run into any problems! Always have a backup plan just in case! Promotion is one of the most important parts of planning an event. The more time you have to promote, the better! Get creative and make your event known! Print some colorful, catchy fliers and posters for your event. Don’t have too many words on the flier. The name of the event, date, and time should be the most visible, and all information/summaries should be limited to 1-2 sentences. Many schools offer a scheduled time to “table” in a University Center or lounge. Print out smaller fliers as well as a larger poster to catch people’s attention. If you’re allowed, candy always works as well! Come up with a catchy slogan and write it in chalk along your school’s sidewalks. 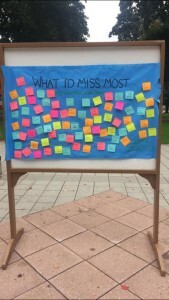 Ask a professor in your department to encourage their students to attend the event. If you will be serving food, make sure to advertise it—make that known- students love free food! Facebook – create a Facebook event including a short summary of the event as well as the date, time, and place. Don’t be shy about promoting it on your chapter’s STAND page as well as your own personal account. Invite everyone on your friend list. Twitter – tweet about your event and ask your friends to do the same. Tweet at your school’s affiliated pages and let them know about your event. Arrive early- make sure that any technology you may need is working, decorate the space, lay out food, and send out one more reminder on Facebook to let everyone know you’re excited to see them! Make your speech- thank your audience for attending and tell them a little about STAND and why you planned the event. Make sure the speech is informative, but also brief. Continue to Promote- think of interesting ways to get STAND’s name out there! Whether it be a table off to the side handing out fliers, or frequent facts dealing with STAND’s conflict areas, it is important that people know what kind of work STAND does. Sign-up Sheet- similarly, always have a sign-up sheet on hand at big events in case anyone is interested in joining your club. Take down their name and email and make sure to let them know when your next meeting or event is! Take Pictures- and share them with STAND! We love to see the work that chapters do and share them on social media. If you have any pictures, send them to info@standnow.org.